At an academic medical center, where physicians, nurses, researchers, and teachers all work in unison, patients have better access to the latest medical breakthroughs and clinical trials. However, the benefits of more advanced care and true collaboration between disciplines also bring a larger, more complicated health system for patients to navigate. To help patients maneuver our academic medical center in the midst of experiencing a scary cancer diagnosis, Penn Medicine provides an experienced oncology nurse with disease site and operational expertise to each patient. 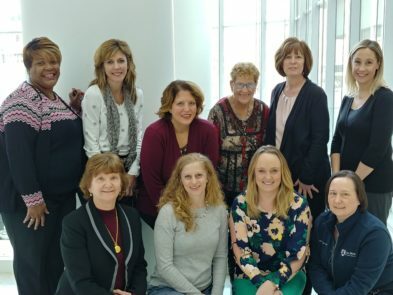 No matter how a patient has found Penn or where they are in their cancer journey, these nurse navigators are available to help patients and families gain access, coordinate their care, and provide any information they need. To make a patient’s cancer care as seamless an experience as possible, navigators collaborate with our call centers, providers (both internal and external), administrative staff, and directly with patients and their families. When patients are referred to a navigator, the nurse navigators assess needs, barriers, and preferences, and they provide information and guidance to patients, caregivers and providers. Nurse navigators make sure patients have their number, so they can call anytime with questions or needs. They work to connect the patient to the right provider at the right time with the right information. The care coordination nurse navigators provide is critical and valuable to patients and providers every step of the way. In addition to collaborating with call centers and care teams, nurse navigators also work closely with Penn Medicine’s strategic marketing services. Awareness about new initiatives from marketing, the cancer center, the health system and beyond is essential because it better helps navigators to serve patients. By understanding the competitive marketplace and how patients are hearing about Penn, nurse navigators can refer them appropriately and avoid delays in care. Through marketing campaigns, patients can self-refer, submitting their information online via a web form, where they must indicate what they’re interested in being contacted about (i.e., requesting an appointment, getting a second opinion, having a question answered, etc.). The navigation team receives these referrals directly from the marketing team, so they are informed on the patients’ needs before reaching out. This prompt, personalized attention provides comfort and confidence to the patient, initiates the process of delivering high quality health care, and brings value to the institution in the form of retention, revenue and reputation. Often, because of the navigation services that Penn Medicine provides, patients may pursue treatment and/or transfer other specialty care here. Alternatively, patients that receive a second opinion or only a portion of their care at Penn can return to their local provider to receive the next treatment with assurance that they can come back any time. Oncology Navigators are able to remain involved throughout the patient care process, to further impact timeliness and adherence to ongoing care. Ultimately, the service that navigators provide to patients and families (and marketing) is strengthened by the collaboration of all of the team members and allows Penn to remain at the forefront of delivering outstanding oncology care.